The rusty-spotted cat is one of the smallest cat species, with a head and body length of up to 48 cm (19") and a weight of up to 1.6 kg (3.5 lb). The rusty-spotted cat's coat is a short, soft fawn-grey with a rufous tinge, patterned with transverse lines of small rusty-brown spots which form solid stripes along the back of the head. The belly, chest, and throat are white, marked with large dark spots and bars. The tail, which averages about half of the head-body length, is faintly marked with dark rings. In India the rusty-spotted cat is found in moist and dry deciduous forests, tropical thorn forest, scrub forest grasslands, arid shrublands, rocky areas, and hill slopes. In Sri Lanka the rusty-spotted cat is found from sea level to elevations of 2100 m (6900‘) in northern low country dry zone, monsoon forest and grassland, southeastern dry zone, monsoon scrub jungle, scrub forest and grassland, lowland regenerating rainforest, arid coastal belts, and on mountaintops. The rusty-spotted cat has been found in areas of human habitation. The rusty-spotted cat mainly feeds on small birds, rodents, frogs, insects and, possibly, small lizards, as well as domestic fowl. 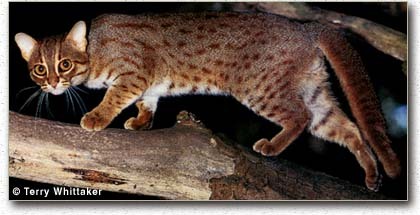 In the wild, rusty-spotted cats are thought to be mainly, but not completely, nocturnal and to spend the daytime resting in a hollow log or dense cover. Early reports suggested that the rusty-spotted cat might be partially arboreal, but in recent sightings the cat has always been seen on the ground. The rusty-spotted cat is found in India and Sri Lanka. In both of these countries, habitat loss and the spread of cultivation are serious problems for wildlife. In addition, rusty-spotted cats are often killed by local people. In Sri Lanka adults are frequently mistaken for baby leopards and killed. In some parts of India and Sri Lanka the flesh of the rusty-spotted cat is considered edible, and a number of cats are killed for this purpose. Road kills are also a growing threat to the rusty-spotted cat. *** Which cat species is the smallest is still open to discussion, with the black-footed cat, kodkod (Chilean cat/guigna), and rusty-spotted cat all candidates for the title (Sunquist & Sunquist 2002) . *** The rusty-spotted cat has been called the hummingbird of the cat family - a fairly apt description, as not only is it about half the size of a domestic cat, but it also is extremely agile and active. (Sunquist & Sunquist 2002) . *** The fact that wild rusty-spotted cats have been found on several occasions to den and breed in the ceiling space of houses, while preying on domestic poultry, is a testimony to feline adaptability (Nowell & Jackson 1996) . 2005: Occurs in India and Sri Lanka (IUCN 2005). The rusty-spotted cat’s total effective population size is estimated at below 10,000 mature breeding individuals (IUCN 2005) . Rusty-spotted cats are often killed by local people. In Sri Lanka adults are frequently mistaken for baby leopards and killed. In some parts of India and Sri Lanka the flesh of the rusty-spotted cat is considered edible, and a number of cats are taken for this purpose. (Sunquist & Sunquist 2002) Road kills are a growing threat to the rusty-spotted cat. In addition, feral dogs attack the rusty-spotted cat, while feral domestic cats pose a threat through competition for food and transmission of disease. (Bambaradeniya & Amarasinghe 2001) Inter-breeding with the domestic cat is also a possibility (Kittle & Watson 2004) . 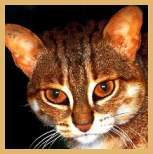 The rusty-spotted cat is found in the Western Ghats and Sri Lanka Biodiversity Hotspot (Cons. Intl. 2005). One female rusty-spotted cat reached sexual maturity at 68 weeks of age (Sunquist & Sunquist 2002) . 66 - 70 days (captivity) (Sunquist & Sunquist 2002) . At least 16 years (captivity) (Nowak 1999) . In the wild, rusty-spotted cats are thought to be mainly, but not completely, nocturnal and to spend the daytime resting in a hollow log or dense cover (Sunquist & Sunquist 2002) . Early reports suggested that the rusty-spotted cat might be partially arboreal, but in recent sightings the cat has always been seen on the ground (Sunquist & Sunquist 2002) .